In the heat of the jungle, in the heat of the night. Sat an African princess in the pale moonlight. She said go bobalu, go baby go, I love, I love you, tonight. I go hide in the jungle, and I dance til' I drop. With an African princess, and nope I don't stop. I watch t.v. til' midnight, I do just what I please. I love you, I love you, tonight. 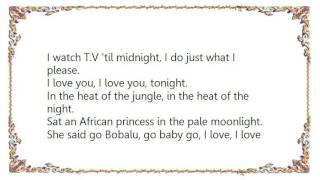 She said go bobalu, go baby go, I love, I love you, goodnight.